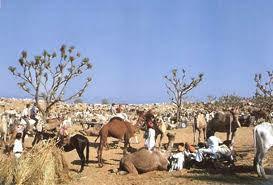 Pushkar Fair popular as Pushkar Camel Fair, attract thousands of tourists in the month of November every year. In addition, a hot spot for the local people, the festival lasts usually for seven to ten days in the year. The "Matka Phod is the important highlight of the place that features many other bridal competitions. Recently, there is an extra feather added to the crown of the state. The Pushkar Lake side stands as the venue for the event where livestock including camels, goats, and cows exchanged. While the men remain engaged in trade, the women are shopping for their family or taking the kids to the entertainment center.Entertainment is unlimited with the rural crowd here gathering for the puppet shows, bridal competition, camel race, and dance events. The camel race takes place onm the very first day of the festival. The camel race, beauty contest, and other rural games mark the fair that has gained immense popularity among visitors. Entertainment over the years has turned up the spirits of the local rural crowd as well as the tourists coming to Rajasthan. From Arab nationals to domestic crowd engages in the shows and the dance performances that scores over any other ceremony in the region. One of the most popular and colorful fairs of Rajasthan is the Pushkar Fair, held annually at the sacred pilgrim destination of Pushkar – renowned for housing the only shrine in entire India that is dedicated to Lord Brahma. A major tourist attraction in Rajasthan, Pushkar fair takes place in the Hindu month of ‘Kartika’ (October or November). The History of Pushkar Fair lies in the Hindu scriptures. Pushkar is one of the five ‘dhams’ or pilgrim centers held in high esteem by Hindus, the other four being Badrinath, Puri, Rameswaram, and Dwarka. Colorfully dressed devotees, musicians, acrobats, folk dancers, traders, comedians, sadhus and tourists from all around the globe come to this small town during the Pushkar Fair. The fair begins on ‘ashtami’ or 8th day of Lunar calendar and continues till full moon (Kartika Poornima). 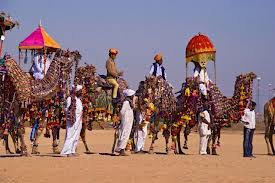 The history of Pushkar Fair states that on the day of Poornima, all the 330 million deities of Hinduism visit Pushkar Lake and bless the devout. So thousands of devotees converge for a holy dip at the lake to wash away their sins and pay obeisance at the only Brahma Temple in the world. 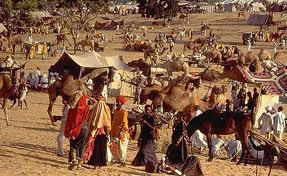 The history of Pushkar fair is also marked by the fact that Kartika Poornima – the day of ritual oblation, is also the closing day of this world renowned festival. The fair is certainly the world’s biggest camel fair. Hundreds of shops sell camels, horses, bulls, cows and other cattle. The fair is a perfect instance of the cohabitation of the religious faith and commercial interest of the human society. and very few fairs in the world can match the liveliness and religious significance associated with this fair. The world’s largest camel fair – the Pushkar Fair held annually in Pushkar, Rajasthan, begins on ‘ashtami’ or 8th day of lunar calendar and continues till full moon (Kartika Poornima). This livestock fair coincides with the climaxing of a religious celebration. A riot of colors and a frenzied burst of activity mark the celebration of Pushkar Fair. 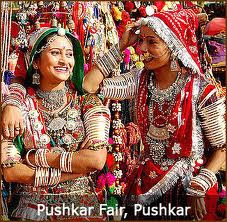 A major tourist attraction in Rajasthan, Pushkar Fair witnesses hundreds and thousands of people from all around the state and from worldwide gathering at Pushkar to enjoy and make merry during this colorful festival. 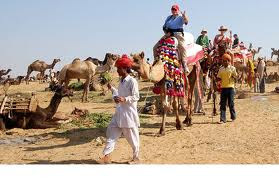 Pushkar being one of the five ‘dhams’ or pilgrim centers held in high esteem by Hindus, immense religious fervor is also associated with the celebration of Pushkar fair. During this fair, thousands of devotees converge for a holy dip at the Pushkar Lake to wash away their sins and pay obeisance at the only Brahma Temple in the world. Pushkar Fair celebrations include an attractive and lively spectacle with Rajasthani men and women in colorful traditional attires, saffron robed and ash-smeared ‘sandhus’ (holy men), and thousands of bulls, cows, sheep, goats, horses and camels in rich decorated saddles spotted al over the town. Trading of cattle, camel races and dazzling displays of bangles, brassware, clothes, camel saddles, and halters make the celebrations of Pushkar Fair all the more colorful. Necklaces of glass beads from Nagaur, pottery, printed textiles from Jodhpur and Ajmer are all on sale at this fair. Farmers, cattle traders and breeders buy and sell cattle, leather whips, saddles, etc. In the afternoons during the fair, hoards of people flock to the stadium where camels, horses and cows are paraded and raced. 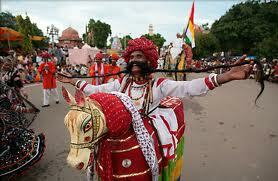 All these and much more fun and frolic form part of the Celebration of Pushkar Fair in Rajasthan. By Bus: Pushkar is 14 km from main Ajmer Bus Stand. Deluxe buses connect Pushkar from Jaipur. Roads are very goods and it takes around 3 hours from Jaipur, the Pink City of India. 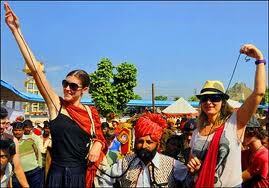 By Train: The nearest Railway Station for Pushkar is Ajmer. Ajmer is well-connected with daily trains from Delhi in morning.